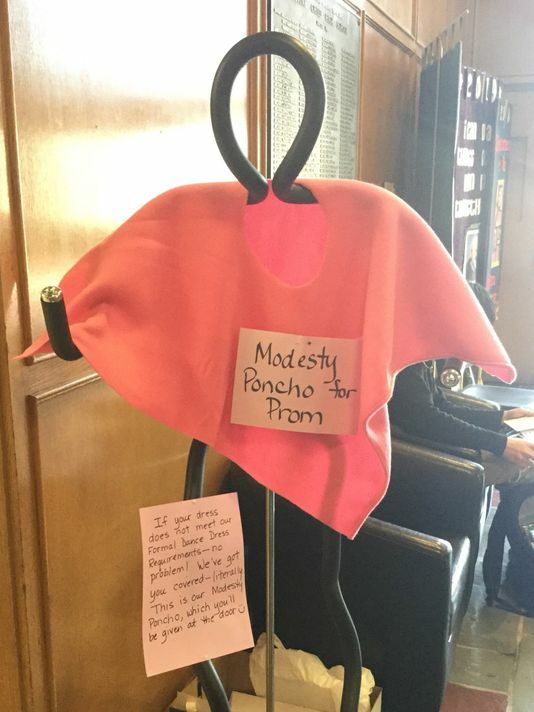 A Catholic high school in the Detroit area plans to hand out ‘modesty ponchos’ to girls whose prom dresses are deemed too ‘revealing’. The tragically unhip note concludes with a smiley face. The modesty ponchos were the brainchild[sic] of theology teacher Mary Pat O’Malley, WJBK reported. Both Erin and her mother believe the dress is modest. But when the modesty poncho made its appearance in the school’s front lobby early last week, Erin said, she became worried about the neckline. She’s now on the hunt for a new dress, with the May 12 prom just days away. “It’s a very stressful time,” she said. The ponchos have been rightly ridiculed and criticized on social media.